On 26 May, pro Government of National Accord (GNA) militias managed to defeat rival anti-GNA militias aligned with hard-line Islamists in an intense battle in Tripoli. 52 people died and more than 130 were injured in the clashes. 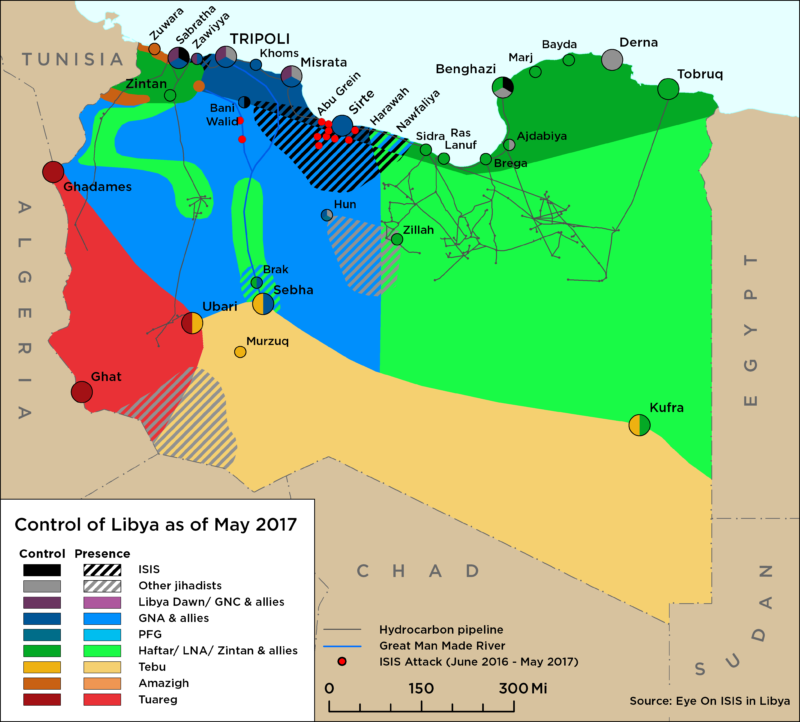 Pro-GNA ‘Tripoli militias’– including the Tripoli Revolutionaries Brigade led by Haithem Tajouri and the Abu Salim brigade led by Ghniwa al-Kikkle, both organised under the GNA’s Ministry of Interior’s central security forces — managed to evict rival militias – supporting the newly formed “Fakhr Libya” or ‘Libya Honor’ coalition, allied to former General National Congress (GNC) prime minister Khalifa al-Ghwell — from their positions in the capital. This has given the GNA nominal territorial control over greater Tripoli. Key sites lost by hardliners include the Hadba prison, where former Qadhafi regime senior officers are detained, a number of military barracks south of the city including the main Yarmouk camp, and Tripoli international airport, which was destroyed in 2014. Local militias destroyed the home of Khalid al-Sherif, head of the Hadba prison and a notorious leader of the Libyan Islamic Fighting Group (LIFG). Pro-GNA militias stormed the building of Libya’s highest religious authority, the Dar al-Iftar, in Tripoli, blockading the gates to prevent the Mufti and other staff from utilizing the building. Grand Mufti Sadeq al-Ghariani is seen as the figurehead for the hard-line, anti-GNA militias in Tripoli. In a significant change of tone, the Libyan National Army (LNA) spokesperson Ahmed Mesmari described the militias aligned with the GNA in Tripoli as “good national forces”, recognized their efforts against ‘Islamist terrorists’ and called for a unified campaign to defend the capital. The bulk of the anti-GNA forces that fought in Tripoli last week reportedly comprised militias from Tarhouna, the Amazigh-dominated Mobile Forces, and Misratan militias. Most of these forces are now understood to have withdrawn to Tarhouna, Zawiyya, and Sabratha, while some of the Misratan militias returned to Misrata. 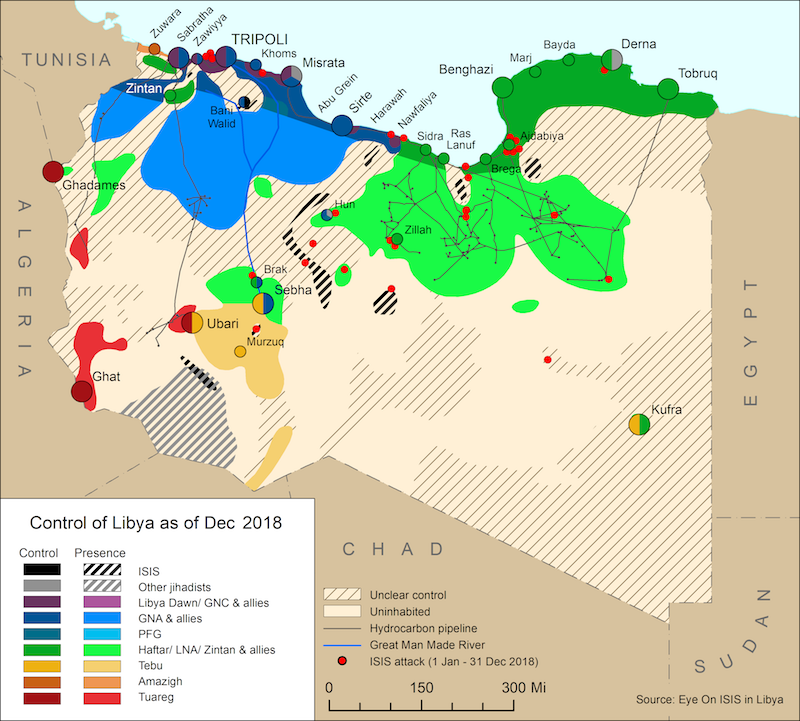 Many pro-GNA Misratan militias also withdrew from their positions in south-western Libya, including at Sharara oil field, Teminhint airbase, and other locations. However, GNA-aligned Misratan forces still retain their positions both in Jufra and Sirte. LNA forces also stormed other positions in Brak al-Shatti and Sebha previously occupied by militias allied to the hard-line factions.